An exhausted mother has made a public plea for a home suitable for her profoundly disabled son. 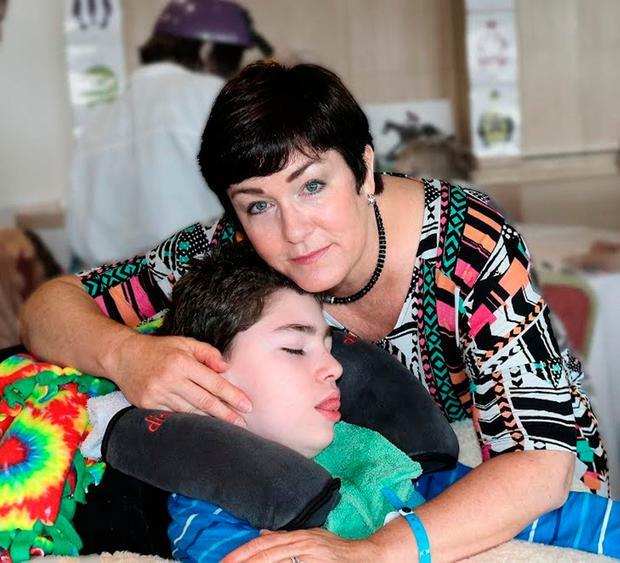 Tracy McGinnis (52) and her 13-year-old son Brendan are victims of the nation's other housing crisis - the nationwide shortage of disability-adapted homes. She is suffering depression and anxiety as she desperately seeks a bungalow that can be adapted for the care of Brendan. "I don't know how long he has to live but I have to keep fighting for him for as long as he lives," she said, referring to him as "my angel". A lone parent, she is the sole carer of Brendan who has severe quadriplegic cerebral palsy and a mental age of three. Brendan has been bedridden 22 hours a day for several months because of a recently healed pressure sore. He was sharing his bed with his wide range of soft toys when the Sunday Independent visited. He suffers from severe epilepsy and urgently needs surgery for scoliosis of the spine. He cannot speak and must be fed through a tube inserted into his stomach. Brendan is also incontinent, suffers acid reflux, has osteoporosis and has lung disease. His profound disabilities are, according to his mum, "life limiting". Tracy lives with Brendan and his brother Declan (nine) in a rented old two-storey house in Dundalk. She said the house is completely unsuitable for Brendan's needs. "His upcoming spinal fusion operation is to take place most likely in July. The spinal team has advised me that they cannot allow Brendan to come home to this house after the surgery because it is unsuitable or unsafe without having an hoist system to move him and to get him to a proper shower room," she said. "I am now in an absolute panic trying to figure out how to secure a suitable, modified house and get the proper overhead hoist system in place all before July's operation." Tracy said she is unable to carry Brendan to give him a shower and she gives him bed baths, which are not satisfactory. "An MRI has shown that I have degenerative discs in my lower back and I also have arthritis," she said. "I am suffering chronic pain." Tracy takes care of Brendan round-the-clock, seven days a week. "I use a video-audio monitor next to my bed at night so I am never fully asleep. So I'm pretty exhausted all the time," she said. "I feel isolated and have suffered depression and anxiety. I'm on an anti-depressant medication." A former child and family therapist, Tracy said Brendan would have been healthy and normal if she had not contracted cytomegalovirus, known as CMV, when she was pregnant. She is a co-founder of the Profound Ireland group, which supports parents of children with severe disabilities. She is also trying to resolve a problem regarding in-home respite care. The HSE has approved five hours a week in-home respite nursing care but Tracy said there have been difficulties about organising a suitable schedule. She is grateful for 15 nights a year respite care from the LauraLynn charity. She can avail of respite assistance from St John of God's Suzanne House in Tallaght for a couple of nights every six or seven weeks until next September, when Brendan will be no longer eligible. Tracy and her sons are on a waiting list for disability housing in County Louth. She said she had been told that a great many families had been on the list for several years. In her quest for a suitable bungalow, Tracy sought help from local councillors and TDs, and she also asked for help from Government ministers. She said an occupational therapist hired by Louth County Council declared Brendan was an urgent priority for a suitably modified bungalow. She has decided to launch her own 'Bungalow For Brendan' campaign in a bid to be able to buy a suitable home. She has written in her blog, Transitioning Angels, that she is "putting aside whatever little pride I have left" in a last-ditch effort. Brendan and his brother Declan have a strong bond of love. "I see Brendan as an angel. He is on this earth for a reason," she said. "To teach unconditional love - that's his gift to us." A spokesman for Louth County Council said: "The council does not comment on individual cases." Catherine Cox, of Family Carers Ireland, said: "The issue of finding accessible housing for children and adults with mobility problems has become more and more difficult. "This coupled with the cuts to housing adaptation grants and long waiting lists for suitable housing has only added to the many challenges facing family carers. "The cost of residential care for a young boy like Brendan would be far in excess of what it would cost to support his mother Tracy to care safely for him in a suitable home which is all they both want. "Unfortunately, Tracy is one of thousands of family carers who are in crisis across Ireland today because of lack of supports and services in the home," she said. Almost 15pc of households on the housing waiting list have special accommodation requirements. Last year, there were 4,326 people waiting for suitable social housing who have enduring physical, sensory, mental health or intellectual issues. There were 2,084 people with physical disabilities awaiting suitable social housing. Carers in need of information or support can contact Family Carers Ireland on the Freephone Careline: 1800 2407 24.